Towards the end of April, as we finished conducting interviews for the group of students who would be joining the Fund in the fall, many of the students asked the same question: “what is your favorite part about being in Rines?” We would also get asked this question by people who wanted to learn more about the Fund and we found ourselves talking about the real-world application of what we learned here in school, the people we get to work with, the fact that it’s extremely cool, but in short, that this organization has accelerated our professional and personal development more than anything else at UNH. One of the most rewarding experiences of being in Rines is the opportunity to attend and sit in on our angel group partner meetings each month. Throughout the year, we have prioritized attendance to angel meetings and these relationships have culminated in internships with multiple industry partners, such as eCoast Angels and 10X Venture Partners. Solidifying these relationships has also allowed the Fund to further be at the forefront of all angel activity throughout New Hampshire, which has increased the strength of the Fund’s brand, deal flow quality, and number of guest speakers. More specifically, this led to many interesting and quality pitches during the year as well as numerous members of regional private equity and venture capital firms sharing their industry knowledge with the Fund. In order to validate the fundamental principles on which the Rines Angel Fund was founded, the progress of Platelet Biogenesis was regularly monitored throughout the school year. Platelet Biogenesis was the Fund’s first investment and has, like the Fund itself, experienced tremendous growth and success. The Fund initially co-invested during the company’s seed round and recently Platelet Biogenesis raised a $10M series A. This recent round of funding indicates that the company is growing rapidly and represents a significant gain on the Fund’s original investment. This also demonstrates the Fund’s ability to recognize a company’s ability to generate value. We look forward to seeing Platelet’s continued success in the future. With that being said, we want to thank everyone in the Fund for a fantastic year. It was a blast working with all of you and we feel privileged to have worked with such motivated and intelligent individuals. Everyone is familiar with the phrase “never be the smartest guy in the room”, and luckily we never had to worry about that. We would also like to thank Dean Merrill-Sands for continually supporting and promoting the Fund throughout Paul College and the University, Professor Jeffrey Sohl for his leadership throughout the year and Laura Hill for her operational assistance. Most importantly, we want to thank Mel Rines for making such a generous donation and creating such an enriching opportunity for everyone in the Fund. We, as well as everyone in the fund, appreciate it more than you’ll ever know. We feel the Fund is finally inching its way out of the startup phase and, with a distinguished executive leadership team and a group of impressive Associates, is well equipped for the future. 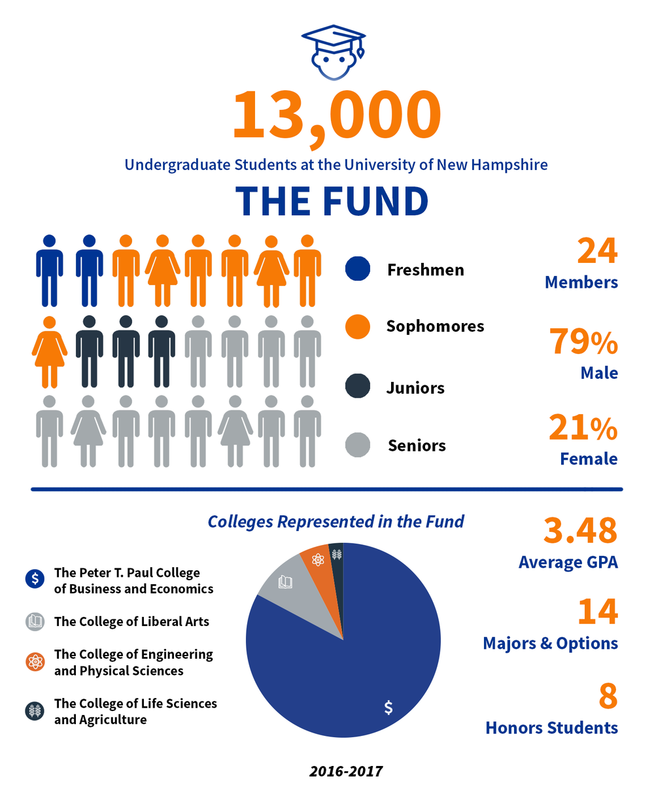 We have no doubt that the Rines Angel Fund will become the preeminent experiential learning class at the University of New Hampshire and we look forward to watching it grow and prosper as it cements its position as a fundamental aspect of the entrepreneurial ecosystem of New England.